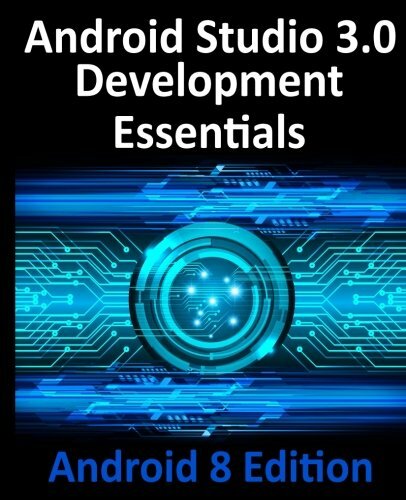 Fully updated for Android Studio 3.0 and Android 8, the goal of this book is to teach the skills necessary to develop Android based applications using the Android Studio Integrated Development Environment (IDE), the Android 8 Software Development Kit (SDK) and the Java programming language. Beginning with the basics, this book provides an outline of the steps necessary to set up an Android development and testing environment. An overview of Android Studio is included covering areas such as tool windows, the code editor and the Layout Editor tool. An introduction to the architecture of Android is followed by an in-depth look at the design of Android applications and user interfaces using the Android Studio environment. More advanced topics such as database management, content providers and intents are also covered, as are touch screen handling, gesture recognition, camera access and the playback and recording of both video and audio. This edition of the book also covers printing, transitions and cloud-based file storage. The concepts of material design are also covered in detail, including the use of floating action buttons, Snackbars, tabbed interfaces, card views, navigation drawers and collapsing toolbars. 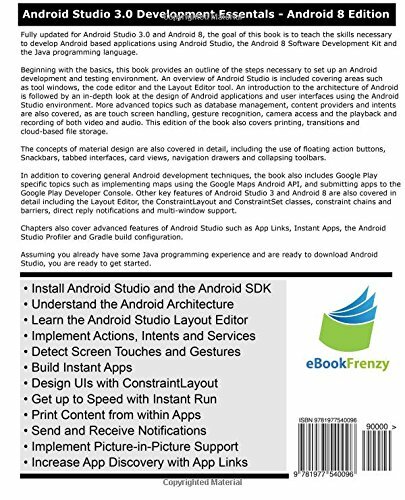 In addition to covering general Android development techniques, the book also includes Google Play specific topics such as implementing maps using the Google Maps Android API, and submitting apps to the Google Play Developer Console. Other key features of Android Studio 3 and Android 8 are also covered in detail including the Layout Editor, the ConstraintLayout and ConstraintSet classes, constraint chains and barriers, direct reply notifications and multi-window support. Chapters also cover advanced features of Android Studio such as App Links, Instant Apps, the Android Studio Profiler and Gradle build configuration. Assuming you already have some Java programming experience, are ready to download Android Studio and the Android SDK, have access to a Windows, Mac or Linux system and ideas for some apps to develop, you are ready to get started. Be the first to comment on "Android Studio 3.0 Development Essentials – Android 8 Edition"